The late 1960s saw the emergence of a group of artists in the USA who painted objects and scenes from daily life with a high degree of realism, using photography as the basis for their works. This new movement achieved international recognition when it participated in the Kassel Documenta of 1972. The present exhibition at the Museo Thyssen-Bornemisza offers the first survey of Hyperrealism, from the great US masters of the first generation such as Richard Estes, John Baeder, Robert Bechtle, Tom Blackwell, Chuck Close and Robert Cottingham, the movement’s continuation in Europe and its impact on painters of subsequent generations up to the present day. 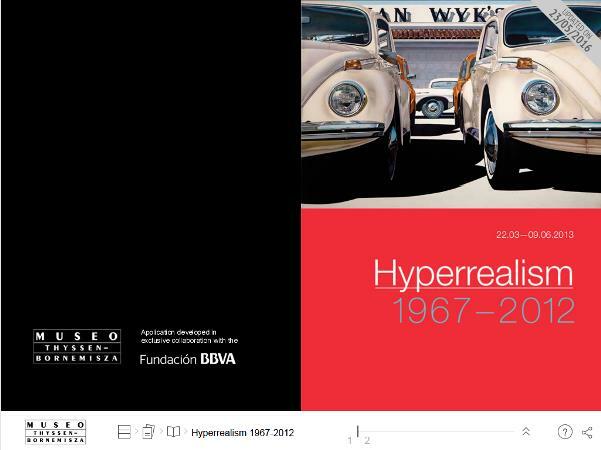 Hyperrealism is not a closed movement and today, more than forty years after it first appeared, many of the group’s pioneers continue to be active, together with new artists who deploy a photo-realist technique in their works. The artistic resources and motifs have evolved and changed over time but Hyperrealist works, with their astonishing definition, precision and detail, continue to fascinate the public. The present exhibition brings together 66 works by three generations of artists, loaned from numerous museums and private collections. It has been organised by the Institut für Kulturaustausch (German Cultural Exchange Institute) and is curated by its director Otto Letze. The Kunsthalle in Tübingen has been the first venue to present the exhibition, which will travel to various European cities. It can be seen at the Museo Thyssen-Bornemisza in Madrid until 9 June, followed by the Birmingham Museum and Art Gallery (UK). The exhibition’s principal aim is to offer visitors a complete survey of the contribution made by Hyperrealism to the history of art and this is the first exhibition on the subject of this scale to be seen in Europe, offering an unprecedented chance to see a large group of works representative of this movement as a whole.